Don't you just love seeing those beautiful interiors magazines covers, where everything matches and look so harmoniously on-trend? They take us to a happy place every time! Little do we know about what it takes to get that perfect shot, with the perfect light and the perfect accessory. Is that plant tropical enough? Is that golden pineapple too yellow? Did anyone see the cake that was meant to be photographed on the kitchen table? We spoke to Charlotte Bolton, London-based interiors magazine stylist, to get an insight of how this dynamic job works and how does she do it to get those amazing shots. Home Staging Association: Charlotte - how long have you worked in magazine interior styling and can you tell us about some of the magazines you’ve styled for? Charlotte Bolton: Sure, I have been working in the UK interiors magazine market for about 20 years now. I started off in London in full time editorial roles with various magazines like Beautiful Homes, Ideal Home and Country Homes & Interiors. When I left to have children, I became a freelance Interiors Writer and Stylist, sourcing and writing up ‘real life’ home renovation stories for similar magazines such as Ideal Home, Homes & Gardens, Living Etc and Your Home. Any writing brief I was given also included ‘dressing’ or ‘styling’ these homes with homey related props for the glossy photos for a finished feature! In the last five years I have grown to adore the styling aspect of my job, I’m much better at it than the writing – I can honestly say I’ve found my true calling! HSA: Did you do any formal/professional training to get into interiors or styling? CB: No, I didn’t as initially my magazine roles were writing related. But I was always interested in what a magazine’s Style Department did and how they worked – then as a freelance writer I just stepped in on shoots to assist photographers with styling when needed, until it came to the point where I styled shoots entirely myself. More than anything you must have a natural eye for styling - and a genuine passion for ‘getting the right look’ no matter what, plus the confidence to say what you think works. You can’t be taught that, it has to come from within and I can’t settle for a look that ‘will just do’. I’ve also done various online Interior Design courses over the years - just for my own interest and helped re-design countless rooms/spaces in friends and family’s homes – hence my new Interior Styling Business! I have the knack of creating a whole new scheme from one basic starting point and can visualise it all in my mind, then execute it. CB: No two days are the same, and it’s fun, crazy, hard work, creative and immensely rewarding! If you’re working on a stylised feature such as a ‘How to Get the Look’ Christmas piece, which shows different scenes and looks, you might be sourcing Christmas trees and decorations in mid June, phoning around shops and online companies to borrow props (shops you mention in the feature get a credit) ready to photograph in July for the December Christmas issue (most magazines work at least four months in advance). I remember having to style a Christmas scene in someone’s house about six years ago, on what was then the hottest day of the year in mid July! It didn’t seem right putting the tree up in 30 degree heat! Or you might be out and about, sourcing props yourself for a shoot – whether that shoot is in a couple of weeks of time – or on that day (last minute key essentials!) Any good stylist will go to the ends of the earth to get the right prop for the right look. My own experiences include trying to find a colour ‘pop’ lime green saucepan and bright red baking accessories for a funky kitchen makeover story with 20 minutes to spare, a copper pineapple ornament for a tropical themed table (had an amazing charity shop find) and a Victoria sponge cake WITH fine sugar on the top (for a ‘time for tea’ scene) with not even a corner shop for miles. Daffodils in mid November was also tough – they were needed for the dining table for a house makeover feature (the feature was appearing the following March so needed to look spring like). Luckily a tiny local greengrocer came to my rescue. Working in someone’s house on a photo shoot you also have to be sensitive to the fact it’s their home, you need to be diplomatic and kind. 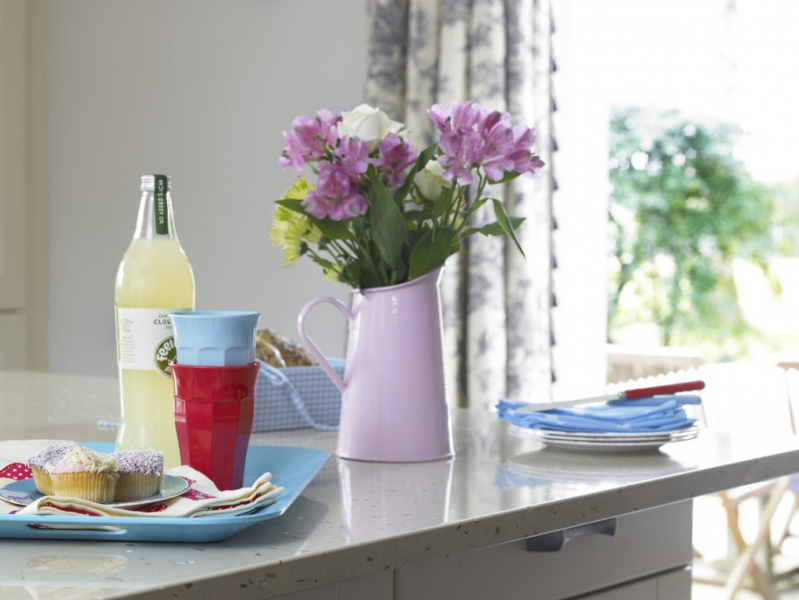 When you arrive you’re setting up, such as laying a table with cutlery and glassware, putting out flowers and perhaps fruit and or cake/bread, decorating worktops/surfaces with props to add colour and life, whilst making sure the homeowner (if they are there) is happy. Then you’re moving props around for the photographer – so they can get the right shots their brief. You must work in conjunction with the photographer and your brief from the magazine and be confident to say if something isn’t working. There are no set rules and if a certain look isn’t working you have to be ready to come up with new suggestions. You have to be strong willed and energetic…not afraid to go the extra mile, be organised, friendly and creative. CB: Styling has to come naturally…I’ve also learned how to style close up shots specifically for photographic composition – AND – that anything is possible! If you want a 6ft Christmas tree for your shoot the next day you can find one. If you need a vintage Hawaiian style doll for a tropical kitchen theme you can find it. This passion translates into providing my private clients with a PERSONAL, ADAPTABLE and CREATIVE interior styling/design service, working with someone who is genuinely passionate about interiors. To view Charlotte’s magazine styling work visit her portfolio website here.